Annie is the story of a plucky, red haired girl who dreams of life outside her dreary orphanage. One day, Annie (Aileen Quinn) is chosen to stay for one week with the famous billionaire "Daddy" Warbucks (Albert Finney). One week turns into many, and the only person standing in the way of Annie's fun is Miss Hannigan, the gin-soaked ruler of the orphanage (played to hilarious perfection by Carol Burnett). Will Miss Hannigan's zany attempts to kidnap the irrepressible Annie succeed? Enjoy all the unforgettable songs, including "It's A Hard-Knock Life" and "Tomorrow." Academy Awards: Nominated for Best Original Song Score; Best Art Direction-Set Decoration, 1983. DVD: Widescreen 2.35:1/16x9, Fullscreen 1.33:1; audio English Dolby Digital 2.0 & Dolby Surround 2.0, French Dolby Surround 2.0; subtitles English, French; closed-captioned; single sided - dual layered; 28 chapters; Rated PG; 127 min. ; $24.95; street date 12/12/00. Supplements: Theatrical Trailers; Talent Files; Production Notes; Original Advertising. All of us have our regrets and can look back at parts of our lives and wonder, “What was I thinking?” Actually, that sentiment covers an awful lot of my life, but no aspect more so than the affection for musicals that I held when I was a kid. By my 12th birthday in 1979, I’d seen the light and I turned toward the forces of good (music) forever - the Beatles saved me - but prior to that, my enjoyment of the era’s pop tunes was mixed with fondness for popular stage musicals. I went to see quite a few of these with my parents, and greatly enjoyed works like The Wiz. Among the list of favorites was Annie, the musical adaptation of the Little Orphan Annie cartoon. It’s hard to remember what an odd project this seemed to be at the time; nowadays everything is adapted into something or other, but I think a musical comic strip was pretty unique when Annie appeared in 1977. Whatever that case may be, the show clearly became a huge success and talk soon turned to the inevitable film version of the stage production. I’m sure this rendition seemed like a sure-fire hit, especially when the enormous popularity of 1978’s movie edition of Grease proved that musicals could still generate boffo box office. Granted, any number of fairly-unsuccessful movie musicals - like that same year’s The Wiz - argued otherwise, but Annie started its journey to film and finally appeared in the summer of 1982. With legendary director John Huston at the reins and boasting a solid cast of professionals like Albert Finney, Carol Burnett, Bernadette Peters, Tim Curry, Ann Reinking and others, plus 10-year-old newcomer Aileen Quinn - the winner of a massive talent search - in the title role, how could it fail? Pretty easily. The movie wasn’t a financial flop but it didn’t generate as much “buzz” as the producers hoped, and its $60 million gross was nothing to cause much excitement. In a busy summer - with much more successful films like E.T., Star Trek II and Poltergeist on screens - Annie came and went without much fuss. Nearly 20 years later - man, do I feel old! - Annie seems just as limp and silly as it did in 1982. As is the case with many musicals, the storyline barely exists. We find Little Orphan Annie (Quinn) stuck in a New York City orphanage with a group of other cute young girls. Despite their bleak lives - they’re constantly hounded by nasty house mother Miss Hannigan (Burnett) - Annie maintains a consistently-cheery disposition and always feels certain that better times are right around the corner; she just knows that her parents will soon come and retrieve her from that nasty orphanage! Some sunshine eventually enters her life when billionaire Oliver Warbucks (Finney) decides to host an orphan for a week as a PR stunt. His assistant Grace (Reinking) picks the irrepressible Annie, and she inevitably wins over gruff “Daddy” Warbucks and all of his staff - which apparently includes President Franklin Roosevelt (Edward Herrmann). Warbucks decides to help Annie find her birth parents, but inevitably, scam artists arrive on the scene in the form of Hannigan, her brother Rooster (Curry), and his girlfriend Lily (Peters). Also inevitably, all ends well as the baddies are punished and Warbucks decides to adopt Annie. While I generally try to avoid too much plot information because I hate to reveal “spoilers”, I took the chance here because - well, c’mon! It’s Annie! It’s not like I’m spilling the beans about The Crying Game or The Sixth Sense. The film features a simplistic plot which exists solely as an excuse to showcase some musical numbers. And that it does, though I couldn’t stand a single tune heard in the movie. Bizarrely, the stage version’s most popular number - the dreadful and ubiquitous “Tomorrow” - loses its solo performance by Annie and is transformed into a sing-along for Annie, Warbucks, FDR and Eleanor! Huh? At least the filmmakers had the good taste to keep the president in his chair; it wouldn’t have surprised me to see them find some way to make FDR dance. “Good taste” is a commodity in short supply through this nauseating film. I frequently had to fight the urge to slap myself; actually, I wanted to slap Quinn due to her disgustingly-forced chipper and cute presence, but since that would be impossible, I just had to hit myself instead. Easily the least palatable scenes in the film are those in the orphanage; there we must confront a slew of precocious and “adorable” youngsters, not just one with a bad perm. I like kids a lot, but not these kinds of artificial show-biz creations who couldn’t take a breath without permission from their stage mothers. One might think that the remainder of the cast would save the project, but they’re rendered impotent in the horrible face of it all. Nothing can negate a) the saccharine-sweet tunes, and b) those damned kids! None of the adults are bad, really - Finney even manages a couple of minor laughs - but they can’t overcome the terror that is Aileen Quinn. They auditioned 8000 kids and she was the best they could do?! Perhaps. I have to admit that Annie would have been a tough sell for me in any case. However, in my defense, I should relate that I’ve developed some grudging admiration for a few movie musicals; after all, I gave My Fair Lady a very positive review, and I even liked parts of West Side Story and The Sound Of Music. Unfortunately, Annie never remotely approaches that level. John Huston isn’t exactly a name I associate with musicals; how he got wrapped up in this clunker is anybody’s case. Whatever the case, Annie is a perfectly dreadful dud. 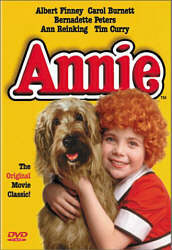 Annie appears in both its original theatrical aspect ratio of approximately 2.35:1 and in a fullscreen edition on this single-sided, double-layered DVD; the letterboxed image has been enhanced for 16X9 televisions. Only the widescreen side was rated for this review. For the most part, the movie looked quite good and only provided a few concerns. Sharpness usually came across as pretty crisp and detailed. At the start and during some interior shots, I thought the picture seemed somewhat bland and fuzzy, but these concerns appeared infrequently. As a whole, the movie was clear and well-defined. Moiré effects and jagged edges created no substantial problems, and artifacts from the anamorphic downconversion on my 4X3 TV seemed minimal. Print flaws also were largely absent. Some light grain could be seen at times, and I also witnessed a few examples of speckles throughout the movie. However, more significant concerns such as grit, scratches, tears, blotches or hairs appeared absent; the movie generally looked nicely clean. Colors also suffered from a slow start, but they soon became quite vivid and vibrant. As a whole, hues were bright and clean and they showed no signs of bleeding or noise. Black levels appeared a bit drab during the early going, and they remained somewhat flat throughout the film, but the dark tones generally were acceptably solid and deep. Shadow detail came across as similarly good but unexceptional; low-light situations were clear and easily visible but they lacked terrific vivacity. All in all, I thought the picture of Annie seemed quite satisfying. However, one caveat has to accompany this discussion. The problem stems from some odd framing during the film. On a number of occasions, the widescreen image was noticeably cropped. Some examples: at 31:15 - when Annie meets the butler - and at 43:34 - when Rooster stands and crows - the tops of the frames chop off their heads. The fullscreen version doesn’t show this weak framing; the entire skulls are clearly visible. How this occurred is anyone’s guess. Most of the movie looked correctly framed, but I found these mistakes to be disconcerting. The Dolby Surround soundtrack of Annie seemed inconsistent but was generally solid for a film of its era. The soundfield stuck strongly to the forward channels for most of the movie. Not surprisingly, music dominated the mix, and the songs and score displayed positive stereo imaging throughout the film. I also heard a lot of good usage of effects from the side channels; these made the track more lively and engaging, and the sounds panned nicely from speaker to speaker. The surrounds largely restricted themselves to general support of the music; the rears offered reinforcement of the tunes but presented little other audio. Sound quality seemed erratic but largely good. Dialogue sometimes appeared a bit thin and reedy, but the speech was generally natural and distinct, and I noted no problems related to intelligibility or edginess. Effects were similarly bland at times, but they generally seemed acceptably accurate and clean. Music varied a bit more. At times the songs were overly warm; they displayed nice punch to the low end but lacked clarity in their highs. However, the tunes usually appeared pretty crisp and smooth and lacked significant problems for most of the film. Ultimately it’s a pretty good soundtrack for a movie from 1982. One concern I had with the audio: it was mastered at a God-awful low level! I had to crank the volume on my receiver much higher than usual to get the movie to a listenable range, and I constantly feared that a loud noise might suddenly emerge and blow my system. That never occurred, but I honestly don’t understand why this recording is so quiet in comparison to most others. Since Annie runs 127 minutes and the DVD includes both the fullscreen and letterboxed versions, that doesn’t leave much room for extras. As such, we find almost nothing here. The DVD features trailers for Annie and Stuart Little plus the usual useless “Talent Files” for director Huston and actors Finney, Burnett, Peters, Reinking, Curry and Quinn; these provide very little information. “Original Advertising” presents eight lobby cards, and the DVD’s booklet offers some surprisingly strong notes about the history of the comic strip, the stage show and the movie, and it even displays a timeline of Little Orphan Annie history. It’s one of the better booklets I’ve seen from Columbia-Tristar. Despite that nice addition, Annie remains a dud because the movie itself is an insufferably cute and cloying concoction. How so much talent wasted itself on this mess is a mystery to me. The DVD offers generally strong picture and sound with almost no extras. It should be noted that the picture suffers from some bizarrely-poor framing at times, however. If you just can’t get enough of wretchedly-adorable urchins who warble sickly-sweet showtunes, Annie is for you; otherwise steer clear of this stinker. Note that even if you decide you want to own Annie, it would be a huge mistake to purchase the current version. The framing is clearly incorrect, and based on their track record, I’d expect CTS will reissue the DVD in a fixed version; they’ve done the same with both Silverado and Leon. More information about this will appear as it becomes available. At this point, however, Annie is a DVD you purchase at your own risk; the misframing may not bother you - after all, it only occurs a few times - but you should be warned that the errors do occur.